Nursing can be a particularly stressful profession. It is not just physically demanding, but mentally and emotionally draining too. Staff surveys highlight how stressful health care can be. Staff absence due to mental ill health at hospitals in England has doubled since 2010, according to the National Health Executive. It states 39% of NHS staff took time off in 2014 because of work-related stress. The RCN’s Beyond breaking point? 2012 survey of 2,008 members examined factors influencing health, wellbeing and stress, including management and peer support, sickness absence policies and occupational health service provision. Half of the respondents said their stress had increased significantly in the previous year. More than half said they had been made unwell by work stress. Nurses blamed a growing workload, staff shortages, lack of rest breaks, long working hours and poor management. ‘This survey shows the level of nurses’ frustration. They are in the front line and trying to hold it together, but can only do this for so long. We know some go home in floods of tears, working in what can feel like a war zone,’ says RCN senior employment relations adviser Kim Sunley. ‘The RCN survey is a warning to employers to make conditions less stressful, because they can ill afford to lose skilled nurses to burnout,’ says Ms Sunley. It is essential to invest in the wellbeing of nursing staff and the promotion of psychological health at work, says Emma Mamo, head of workplace wellbeing at the charity Mind. 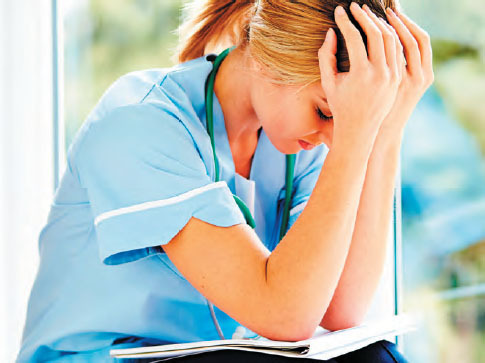 ‘Stress-related sickness absence among nursing staff is high. We want to see employers create a culture where employees feel able to open up if they are struggling with their mental health. That way they can access additional support before things deteriorate, and may prevent the need for time off,’ says Ms Mamo. NHS Employers has been working to tackle and prevent work stress. The How are you feeling today? initiative informs staff and managers about signs of stress, makes them aware of the effects on patients and colleagues, and points to support services. There is also a training programme for managers. Warning signs include feeling worried and tired all the time, and sleeping badly, advises consultant psychiatrist Jim Bolton. ‘When our feelings affect our work and the way we get on with our family, or if we feel life isn’t worth living – these are signs to seek support,’ he adds. ‘Nurses experiencing these symptoms should ask themselves “What can I do to manage this?”, and if they are concerned their employer is not doing enough they should speak to their RCN representative to raise concerns,’ advises Ms Sunley. There are simple steps to reduce stress levels, such as breathing techniques. Other measures include taking regular exercise, avoiding excessive drinking and smoking, and keeping in touch with family and friends. Learn to say ‘no’, says Dr Bolton. ‘Try not to get overloaded. Delegate, take regular breaks and have regular mealtimes,’ he says, adding that ‘no health without mental health’ is a useful maxim. Tel: 0345 408 4391 seven days a week, 8.30am-8.30pm.